I prefer WCC to WDC if I have to choose. However being a pragmatist , I am not going to get issues in the team and this is how the team works, for eons. One driver to get the WDC, two drivers to fight for the WCC. OK, I just looked up that word Pragmatist, fair enough , that's how F1 teams work. I just don't agree with holding a driver back with team orders from race day one , if there's a close race. Of course one guy is going to get ahead on points, then the #2 guy has to shut up and continue to let him pass . Meanwhile, Come on Seb!! Wave that famous #1 finger for Ferrari !! Ditto. Now it means "Ferrari e numero uno!" Can't wait for the break to end so we can get back to some racing. Yes the month is dragging but it's doing my blood pressure a world of good.....we HAVE to have the best possible results at Spa and Monza to get back on terms with HAM, otherwise I fear we will be doomed once again. Let's hope it doesn't rain!! Two-time F1 world champion Mika Hakkinen sees many shades of his great rival Michael Schumacher when studying the style of Sebastian Vettel. As McLaren and Ferrari stalwarts, Hakkinen and Schmacher enjoyed many great battles together, and is reminded of his former nemesis when watching Vettel, the great German's countryman. "I first think of Sebastian’s driving style as unique, but the similarities to Michael are there," Hakkinen told Speedweek. "He always braked at the same point, always drove the same line, accelerated very sensitively, everything controlled. "It’s a very good, clear, clean and aggressive driving style. Even over the curbs, he always has the car under control." 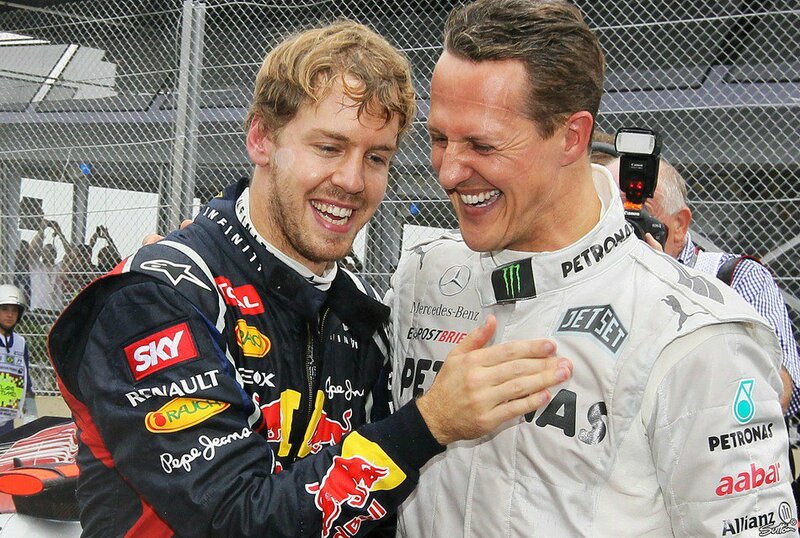 asked who is the best driver that has ever raced for Red Bull, Christian Horner said: "Sebastian Vettel". Horner on Vettel: The pressure is probably a bit different at Ferrari, I think at Red Bull it was arguably a more relaxed atmosphere, he hasn’t got the nation’s hopes resting on his shoulders. Horner on Vettel: Ferrari obviously is a different beast to operate and you can see Sebastian, he carries that pressure. He’s very much a rock within that team. Ooo i cant wait until the next GP, hopefully we get to see some lion laps and races from Seb!! Badluck has cost him a lot the first half of the season, hopefully the second half he gets some goodluck and NO RAIN!!! please Lordy! 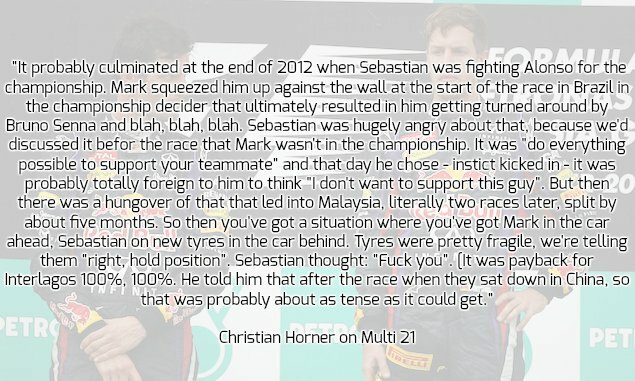 the legend Seb had a point. Todt , Schumy, Seb , Briatore, F1 legends for sure! A few more wins and podiums and Lewis may get the stamp also. He secured more wins than those signed up #2 guys for sure! Now he needs to beat Lewis , another #1 guy . Indeed. I will be not be pleased if Ferrari fails to win a single championship this year. Let's hope our #1 guy delivers. I'll even accept a win or some more podiums from Kimi! Spa is Kimi's favorite track, the king of spa. so if its dry (by some divine intervention) would love to see how much quicker kimi can quali ahead of seb . Best chance for Kimi to win on pure pace this year Imo. Either way whilst i rather hope Seb can win for the sake of the championship, it'l be interesting to see how much quicker kimi is at his favorite track. I am really disappointed to see that administrator Rob has closed a Thread about Sebastian Vettel! The fact that Mr. ROB obviously cannot deal with, is that Sebastian is losing too many points for no reason! And I dont see the reason why, because of that fact, he closed the Thread!!??? May be you would like to close this Thread about Sebastian too? I am also saying ("trolling") that Sebastian (as he is proving) is not capable to win a title for Ferrari unless Ferrari gives him 1sec faster car than any other (like he had in RB)! I dont understand why people tear through Vettel for tangling with Lewis, and then go on and idolize Max V who tangled with other drivers time and again. That's not how you support your team. Like it or not, Vettel is our one and only chance at the WDC. At times when other great drivers like Alonso didn't want to wait around for Ferrari to climb back up, Vettel jump on the chance believing in the team. Anyone really think Lewis would want to drive for Ferrari 2 years ago? Not a chance. At the end of the day, Vettel is our driver, not Lewis or Alonso. Criticizing him while worshiping other drivers is not what we need. He didnt close it down because of that reason. Rob said: "no need to have thread dediicated to running out drivers down." . I say Sebastian is running himself down! Sebastian has proved this year and last year that he is not capable to win a title witout superior car! Ferrari doesnt need a drive who is not capable of winning title with this years car, end of story!!! With your logic then so is Lewis Hamilton. The team believe so much in his talent to win that they needed Bottas to slow Kimi down / ruin his tires. Toto even had the cheek to say both strategies benefited their drivers when clearly Bottas finished 4th (nevermind the penalty to JV). Their strategy cost a position for Bottas in reality. If anyone thought the Ferrari was superior then feel free to point out where in Monza it was. Pole doesn't make it a better car as we have seen this many times. If that was the case then Lewis should have won Spa and ViceVersa in Monza. Vettel is under severe pressure, which makes the mistake possible. Ferrari also contributed to this, because it allowed the racing between Vettel and Kimi. Why are you ignoring context with regards to Bottas? Max had already passed Bottas at the start and Bottas spent the whole stint unable to repass him. Bottas was already in 4th. Why are you trying so hard to make it seem like Mercedes gave him a strategy that dropped him from 3rd to 4th. Just because Vettel is making terrible mistakes doesn’t mean you have to be disparaging to the opposition team. They saw an opportunity to give Bottas a fighting chance with Fresher tyres at the end and they took it. Any team would do the same, and it worked as he finished 3rd instead of 4th if they had just mirrored Max. Nothing sinister in that at all just a remarkable coincidence that Bottas’ best strategy also meant he interfered with Kimi’s race. MERCEDS DID NOT SACRIFICE BOTTAS. It’s absurd to think so. As Toto said, Bottas is a good wingman.